The team of scientists from the LIGO and Virgo observatories have confirmed they witnessed both gravitational waves and light coming from the collision of two neutron stars, definitively proving Einstein’s General Theory of Relativity. Hundreds of scientists from 70 observatories on all seven continents – as well as an additional seven space-based laboratories – combined their resources and expertise to analyze the signal detected on August 17 this year. “As these neutron stars spiraled together, they emitted gravitational waves that were detectable for about 100 seconds; when they collided, a flash of light in the form of gamma rays was emitted and seen on Earth about two seconds after the gravitational waves,” the researchers wrote in a press release. The scientific community, using some of the most sensitive machines ever built by humankind, managed to determine that the two dense, dead stars were 200 miles apart before they merged just 100 seconds later, producing ripples in the fabric of space time. “It is tremendously exciting to experience a rare event that transforms our understanding of the workings of the universe,” says France A. Córdova, director of the National Science Foundation (NSF), which funds LIGO. “This discovery realizes a long-standing goal many of us have had, that is, to simultaneously observe rare cosmic events using both traditional as well as gravitational-wave observatories,” she added. Neutron stars are produced following a supernova, one of the most spectacular cosmic events of which we’re aware. 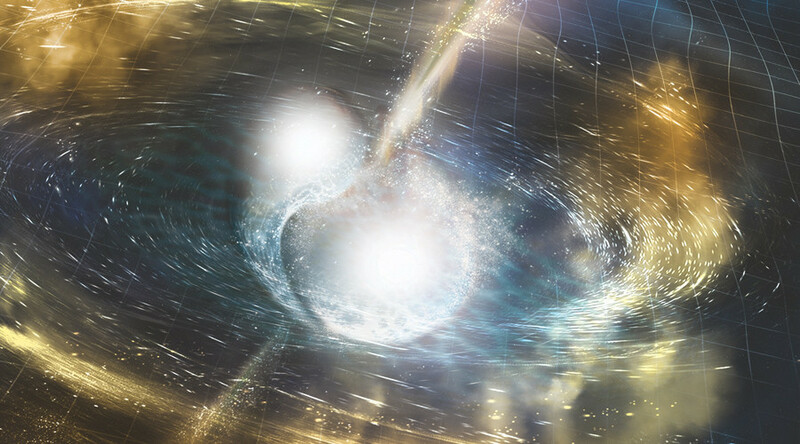 This collision event between two neutron stars is classified as a kilonova, which is even bigger. The density of neutron stars is roughly three times greater than a normal star (for context, a neutron star measures approximately 20-25kms in diameter). The gamma rays and gravitational waves emitted by the collision both travelled at the speed of light, 130 million years travel time, and were detected at almost the exact same time, proving Einstein’s General Theory of Relativity was correct. During the press conference, the team confirmed that this is the first time the cosmos has provided a “talking movie,” complete with an audible pop, as opposed to the silent movies we have witnessed thus far in our exploration of space. The researchers confirmed predictions that some of the heaviest elements we know of, such as gold and platinum, are formed in these types of collisions. It was the first time the new field of gravitational wave astronomy was combined with more traditional methods of astronomy to produce what the researchers described as “high risk, high reward” science.